Sage is a perennial, evergreen shrub which is native to the Mediterranean regions but has been transported and now survives in many places around the world. It is an ancient herb that has been grown for centuries during which time it has been used extensively in food, as well as for its medicinal and healing properties. There are several different cultivars of sage, the most common of which grows to an approximate height of 60cm. The stems are woody and the oblong, greyish green leaves are around 6.5cm long by 2.5cm wide. The leaves are covered in a thick coat of short, very soft hairs with many more on the underside of the leaf than on the top. 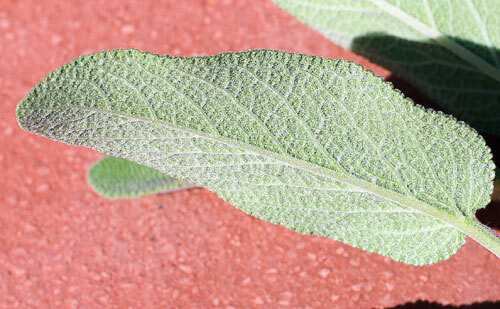 These hairs give the whole sage bush a slightly silvery, dusty appearance. The sage plant flowers during very late spring or summer, depending on the climate, and produces quite tall, pale lilac flowers. It has a strong scent and a strong flavour which has a hint of pepper. Sage is very easy to grow and needs little care and is an ideal herb to grow in containers as it likes well drained soil. It will grow almost anywhere but does like plenty of sunlight, in fact, the more sun it gets the tastier the leaves will be. Also, unlike most herbs, the flavour of the leaves intensifies as the plant gets older and bigger. It is not affected by any pests and makes a good companion plant for carrots, cabbage and tomatoes. In Italian cookery it is used sparingly as the taste can be quite overpowering. In many regions of Italy a few leaves of sage are chopped very finely and combined with melted butter to be used as a sauce over ravioli. In other parts of the world, mainly Britain and America, the strong taste of sage is used to make stuffings to accompany chicken and turkey. In ancient times sage was used to ward off evil spirits, as well as for snakebites and increasing fertility in women. The Romans used it extensively in medicine, mainly as a local anesthetic and as a diuretic. It is still used today for its antibacterial properties, in throat and mouthwashes, as a digestive aid, a diuretic, to heal skin sores and swollen gums and to treat insect bites. It is also believed to improve the memory and sharpen the senses which has led to the theory that it may well have some benefits for treating Alzheimer’s disease. Cosmetically it is believed to be beneficial to both the skin and the hair. 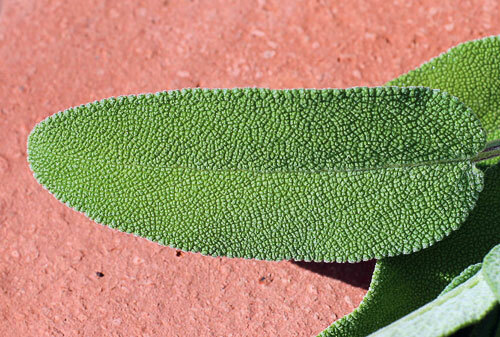 It is good for oily skin and the antibacterial properties of sage make it good for sensitive skin and acne. It is also believed to contain antioxidants which provide protection against the free radicals that damage the skin. For the hair, it is well known that it makes hair shiny but it is also reputed to darken the colour. It stimulates hair growth and is therefore often used in treatments for hair loss. It is very closely related to Rosemary and they are considered to be 'sister' plants. The name 'Salvia' comes from the Latin word 'Salvere' which literally means 'to save' It earned this title by having more healing properties than any other herb. It has the longest history of any medicinal herb. It was used as a meat preservative in ancient Greece and Rome. In the Middle Ages it was one of the ingredients in a potion called 'Four Thieves Vinegar' which was reputed to ward off the dreaded plague. 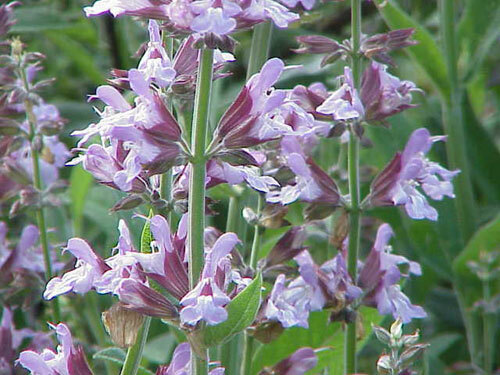 Sage is reputed to reduce menopausal symptoms, in particular, hot flushes.